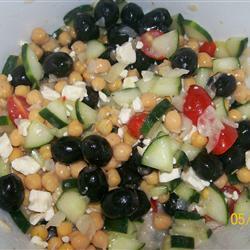 This is a simple dish to make and a Greek favorite. 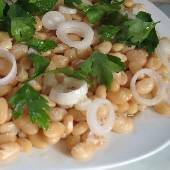 Great Northern or navy beans are my choice, but you can use any dried white beans. 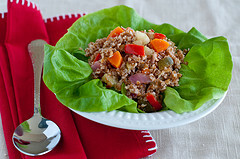 This is a great dish to include in a picnic or cookout menu! Enjoy it as a salad, appetizer, or side dish. Day One: Pur the beans in a colander or bowl and check for any damaged beans or debris and discard. In a large pot or bowl, soak the beans overnight in plenty of cold water to cover generously. Day Two: Drain beans and rinse under running water. Add beans to a large pot with 10-12 cups of fresh cold water. Bring to a boil, add 1-2 teaspoons of sea salt, cover, reduce heat to low, and simmer for 1 hour and 30 minutes. Drain and transfer to a serving bowl. Season to taste with salt and pepper. Add the onion slices on top and sprinkle with chopped parsley. Serve warm, at room temperature, or chilled, with olive oil and vinegar on the side. Note: A 15oz can of beans is about 1 1/2 cups of drained beans. Pour beans into a colander and rinse well under running water. Season with salt and pepper, add the onion slices on top and sprinkle with chopped parsley. 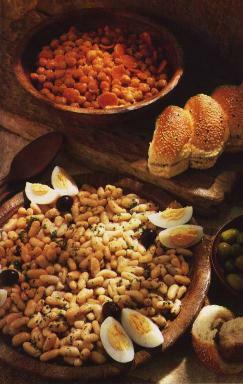 Serve with olive oil and vinegar on the side.